Bali is not the only place in Indonesia with phenomenal diving. To ensure we can provide a comprehensive service for our clients, AquaMarine Diving – Bali is as an agent for other reputable dive resorts and liveaboards throughout Indonesia. AquaMarine can make domestic flight bookings on your behalf. It is often difficult to obtain up-to-date schedules when you are making arrangements for internal flights. There are many benefits to booking your Indonesia Diving through AquaMarine. 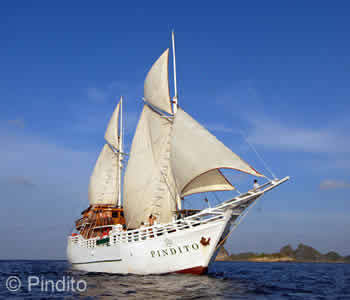 Indonesia has liveaboard options to suit every taste and budget. Vessels range from traditionally built yachts to modern motor vessels. Liveaboards have all ranges of accommodation from simple cabins to 5 star luxury staterooms. To whet your appetite for cruising Indonesia’s fantastic dive sites, we publish a monthly newsletter. Each newsletter includes many special offers each month. Included are a variety of the liveaboards operating in the region. Mermaid Liveaboards, Indonesia. Komodo, Raja Ampat, Bali and more! This backpacker haven offers an unhurried pace with no motorised transport; below waters it boasts an extensive Biorock reef. Offers pristine reefs, amazing marine diversity and the possibility to dive with schooling Hammerhead sharks. This World Heritage Site has beautiful corals, macro critters, lots of pelagics, mangrove dives and Komodo Dragons. The corals are in pristine condition and the variety of fish is outstanding. The highlight of the area is wall diving however Maumere Bay also has some great muck sites. Known for its currents and unspoiled walls, the appeal of Alor’s diving includes its remoteness, the huge schools of fish, and pelagics. Recently in the news for its muck and critter sightings, Ambon is better known for caves, reefs, wrecks and drift-diving. This area of astounding marine biodiversity is known to have more than 1,200 fish species and offers walls, caverns, lagoons, exposed pinnacles and Bluewater mangroves. Now integrated into several Liveaboards’ West Papua itineraries, Cendrawasih Bay is famous for its resident whalesharks. Triton Bay is the current Must-Do dive location! Surrounded by deep trenches that ensure a constant flow of nutrient-rich waters to these spectacular wall dives. Black sand sites remain the top draw however Lembeh also has shipwrecks and an impressive array of underwater topography. Magnificent, colourful soft coral gardens can be found hanging on most walls and pinnacles, plus white sandy beaches. The varied marine environment provides divers with caverns, coral walls, muck, multiple pinnacles, shallow coral gardens, submerged points and two wrecks. Throughout this region the diving consists of extensive reefs with some dramatic drop-offs abounding with sea fans and gigantic sponges. Impressive drop-offs for pelagic-sightings, a beautiful atoll, turtle breeding ground and an inland jellyfish lake.